We know, geography isn't everyone's forte. 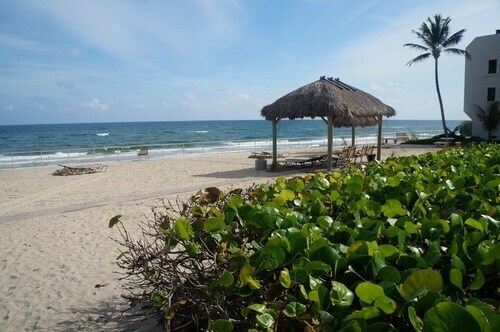 If you're unsure where Hillsboro Beach lies on a map, it's a good idea to brush up on its location before you fly off! A neighborhood in the fine city of Fort Lauderdale, Hillsboro Beach is 11 miles (18 kilometers) north of the downtown action. Forget the sights — it's the locals that make a place tick. Here in Fort Lauderdale, you'll find 170,000 of them. It's so simple to plan a getaway in Hillsboro Beach with Travelocity. Unbelievable savings will be yours when you book an accommodation and airfare deal. And it keeps getting better — you can choose from more than 400 partner airlines and 665,000 places to stay. From accommodations and flights to activities and car rentals, we can give you 24/7 personal assistance with our Customer 1st Guarantee. If you spot a better price on a different site, we'll refund the difference^. You simply never know when something will come up. However, when you book a deal, we guarantee that there'll be no cancellation charges from us. And so long as you get in fast, many accommodations don't charge fees either^. Are you searching for a place to stay in Hillsboro Beach? You'll have to look a little further out. Choose from 82 properties just a short drive away from this charming neighborhood. Want some inspiration for your stay? We recommend the Boca Beach Club, A Waldorf Astoria Resort (900 S Ocean Blvd) and the Ventura at Boca Raton (2301 S Ocean Blvd). Where do you fly into for Hillsboro Beach? Flying into Fort Lauderdale - Hollywood International Airport (FLL)? Hillsboro Beach is 15 miles (24 kilometers) away. Grab a cup of coffee, hop in a cab and you'll arrive in no time at all! Can I rent a car in Hillsboro Beach? Going off the beaten path is a great way to experience the local culture. So, why not do it from the driver's seat? Organize a car rental via Travelocity and get ready to crank up your favorite tunes in Hillsboro Beach. Picking up a car right at Fort Lauderdale - Hollywood International Airport means that you don't have to deal with transfers and cabs. You won't have to wander far to find Thrifty Car Rental and Payless. Is the city your first stop? Thrifty Car Rental is located 1 mile (2 kilometers) from the middle of town at 3400 N Federal Highway. Another rental outlet sitting just 2 miles (3 kilometers) from the middle of the city is Enterprise at 2831 N. Federal Highway. Shopaholics rejoice — you'll be able to indulge in some retail therapy at Pompano Citi Centre. Ready to work that credit card and shop up a storm? Need more? Whether you're a pinball expert or a complete rookie, Diamond Strike has a wicked range of machines and activities to suit all skill levels. But that's not all there is. Do you fancy some retail therapy? Browse Dixie Divers and see if anything floats your boat. Why not head to Lighthouse Point? You'll find it about 0.8 miles (1.3 kilometers) away. Situated on the beach, this property is within 3 mi (5 km) of Deerfield Beach Pier, Deerfield Island Park, and South Inlet Park Beach. South Beach Park and Mizner Park are also within 6 mi (10 km). 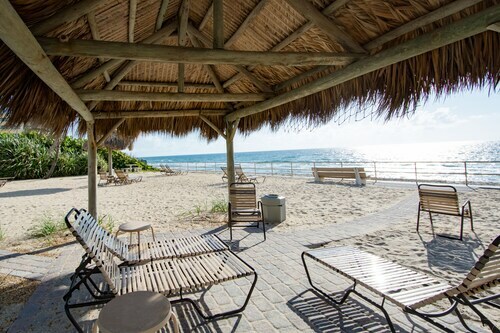 Located in the heart of Hillsboro Beach, this historic resort is within 3 mi (5 km) of Deerfield Beach Pier, Deerfield Island Park, and South Inlet Park Beach. South Beach Park and Mizner Park are also within 6 mi (10 km). Situated on the beach, this historic resort is within 3 mi (5 km) of Deerfield Beach Pier, Deerfield Island Park, and South Inlet Park Beach. South Beach Park and Mizner Park are also within 6 mi (10 km). Full Studio/efficency Steps From THE Beach!! 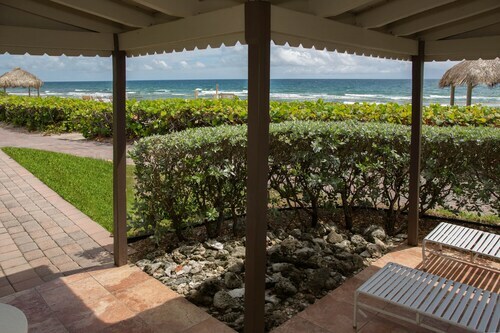 Situated in Hillsboro Beach, this property is 0.8 mi (1.3 km) from Deerfield Beach Pier and 3.1 mi (5 km) from South Beach Park. Deerfield Island Park and South Inlet Park Beach are also within 3 mi (5 km). Nestled on the beach, this Hillsboro Beach vacation home is within 3 mi (5 km) of Pompano Municipal Pier, Pompano Beach Municipal Golf Course, and Pompano Beach Aquatics Center. Fort Lauderdale Beach and Anglins Fishing Pier are also within 6 mi (10 km). Situated on the beach, this romantic condo building is within 3 mi (5 km) of Deerfield Beach Pier, Deerfield Island Park, and South Inlet Park Beach. South Beach Park and Mizner Park are also within 6 mi (10 km).